Accurate determination of LV volume, ejection fraction and segmental wall motion abnormalities is important for clinical decision-making and follow-up assessment. Currently, echocardiography is the most common used method to obtain this information. Three-dimensional echocardiography has shown to be an accurate and reproducible method for LV quantitation, mainly by avoiding the use of geometric assumptions. In this review, we describe various methods to acquire a 3D-dataset for LV volume and wall motion analysis, including their advantages and limitations. We provide an overview of studies comparing LV volume and function measurement by various gated and real-time methods of acquisition compared to magnetic resonance imaging. New technical improvements, such as automated endocardial border detection and contrast enhancement, will make accurate on-line assessment with little operator interaction possible in the near future. Accurate quantification of left ventricular (LV) volume and function is important in clinical decision-making and follow-up assessment. Although various other techniques including invasive angiography, radionuclide angiography and magnetic resonance imaging are used, echocardiography is currently the most commonly applied modality in the practice of cardiology. M-mode echocardiography, a one dimensional ultrasound scanning of the cardiac structures, was developed in the early 1970s and immediately applied in practice for left ventricular function assessment because of its simple algorithm and non-invasiveness. Ejection fraction was estimated as a percentage derived from the mid left ventricular diameters in end-systole and end-diastole and expressed as fractional shortening. However, serious problems were raised especially in patients with myocardial infarction and asymmetric ventricles. Two-dimensional sectional echocardiography, with the ability of imaging of the heart in tomographic views, considerably improved the accuracy of left ventricular volume measurement. Of the different mathematical models, modified biplane Simpson's rule provided more accurate data in both symmetric and asymmetric left ventricles. Software-based algorithms for automatic endocardial border detection and on-line calculation of left ventricular volume and ejection fraction have been developed. As a result, two-dimensional echocardiography has become a routine examination for left ventricular volume and function assessment but the assumptions about LV geometry remain a limitation. 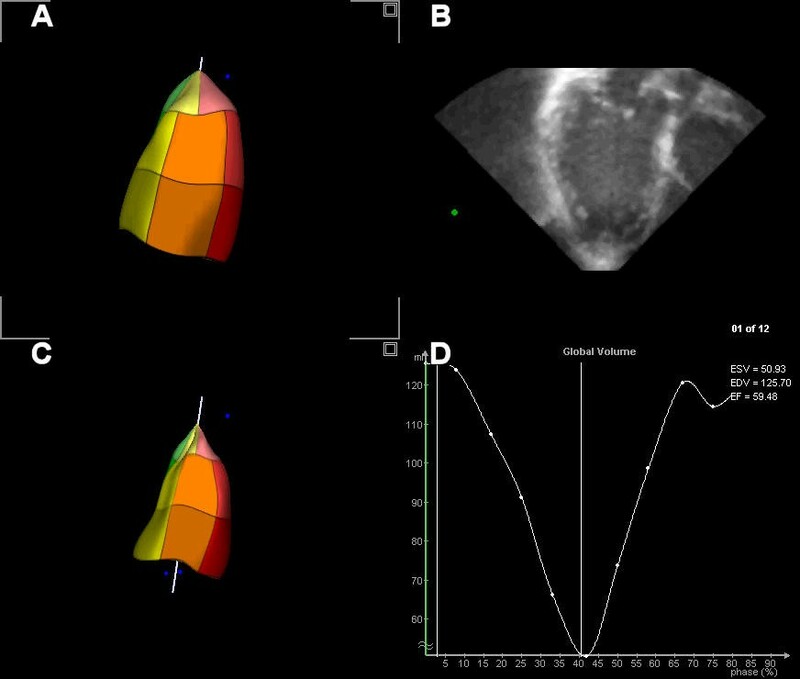 In the past decade, three-dimensional echocardiography has emerged as a more accurate and reproducible approach to LV quantitation mainly by avoiding the use of geometric assumptions of the LV shape. Three methods have been proposed for the acquisition of temporal and positional image data: the use of positional locators (free-hand scanning), rotational systems and real-time volumetric scanning. Reconstruction methods using positional locators and rotational scanning systems require additional intervention for respiratory gating (or breath-hold) and off-line post-processing of data using specific software. This has limited current routine application in clinical practice. Real-time three-dimensional echocardiography has a great potential for immediate assessment of LV function in various clinical scenarios including stress echocardiography and during interventional procedures. However, all methods need a stable cardiac rhythm and constant cardiac function during image acquisition. Different devices have been developed for locating the ultrasound transducer and the imaging planes through the ventricles [1, 2]. These devices allow free movement of the transducer at one acoustic window or at different acoustic windows. An intersectional line or an image plane (usually a longitudinal view of the left ventricle) is used to guide the position and orientation of other imaging planes. The endocardial border of the left ventricle on each cross-sectional view is manually traced. All the traced lines are connected according to their spatial order to form a three-dimensional wire-frame image. The volume of the left ventricle is then calculated by the wedge summation method. Accurate results from this mode of reconstruction have been achieved in both symmetrical and aneurysmatic left ventricles. The limitation of this method is that the spaces between the sampled cross-sectional images are uneven and mistakes may result when interpolating big gaps between imaged planes. Furthermore, the reconstructed three-dimensional images are static and lack tissue depiction, which limits accurate endocardial border identification. Parallel imaging can be performed by computer-controlled movement of the ultrasound transducer in a linear direction (Figure 1). Both a transthoracic and transoesophageal approach were evaluated for this mode of data acquisition. Different methods of data acquisition for transthoracic 3D-echocardiography. Continuous rotation results, unlike stepwise rotational scanning, in a curved shape of the original images. Real-time imaging provides a pyramidal dataset instantly. A pyramidal dataset can be obtained by moving the ultrasound transducer in a fan-like arc at prescribed angles (Figure 1). This is accomplished by computer-controlled motors adapted to the transthoracic or transoesophageal probe . In this approach, the transducer is rotated around its central axis, resulting in a conical volume dataset (Figure 1). Different algorithms have been developed for computer-controlled sequential image collection of the heart . The endocardial contours of a series of images obtained with a multiplane (omniplane) precordial transducer can be directly traced and used for volume calculation. In three-dimensional reconstruction, a series of images with rotational intervals between 2° and 16° is acquired and a voxel-based three-dimensional dataset is realised. With volume-rendering and various shading techniques, the reconstructed image accurately portrays the tissue characteristics and depth of the cardiac anatomy. Paraplane methods provide multiple equidistant parallel short-axis planes (discs) allowing systematic cross-sectional review of the three-dimensional dataset. It has been shown that slices up to a thickness of 10 mm allow accurate volume determination . By tracing the left ventricular endocardial border in each short-axis image, the volume of each slice is calculated by the computer since the slice thickness is known. A summation of the volumes of all slices yields the total volume of the left ventricular cavity at end-diastole or end-systole [4, 5]. Subtraction of end-systolic volume from end-diastolic volume results in stroke volume of the left ventricle. The percentage of stroke volume over end-diastolic volume represents left ventricular ejection fraction. Other algorithms for volume calculation, such as TomTec 4DLV analysis software, are based on the analysis of long-axis views (Figure 2). This software is able to display a dynamic reconstruction of the LV after semi-automated border detection [see additional file 1]. Not only the sizes and shapes of the left ventricle, but also the regional wall motion of the myocardium can be analysed. End-diastolic (A) and End-systolic (C) reconstruction of the left ventricle after semi-automated border analysis of the long-axis views (B). Time volume curve from which ejection fraction can be derived (D). 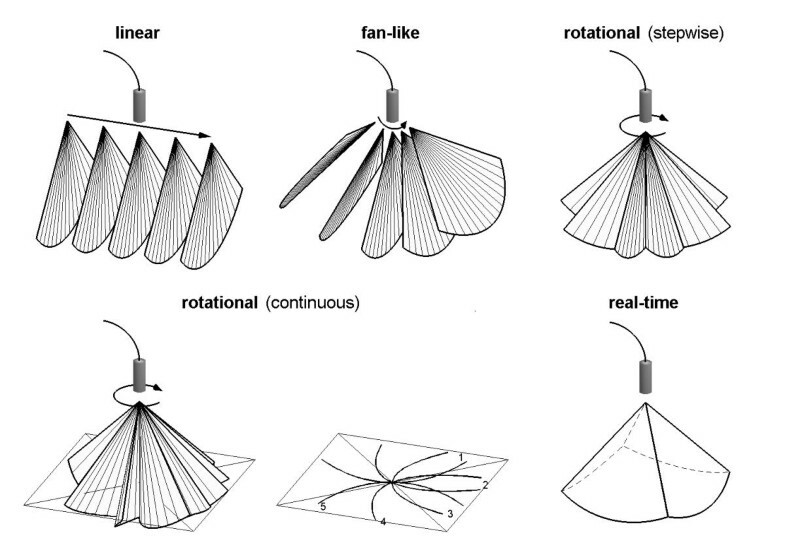 Various acquisition methods based on continuous rotation with an internally rotating array are reported [6–8]. Some models require inversion of rotation because of cable twisting, thereby making the acquisition less efficient and the reconstruction of datasets more complex. Fast continuous rotational scanning of the LV from an apical window can be performed with a newly developed transducer assembly using a standard second-harmonic phased-array transducer and ultrasound system (VingMed Vivid 5) and allows acquisition of 16 volumetric datasets/sec . The typical acquisition time of 10s makes it possible to acquire all data during a single breath-hold. A slipring, consisting of a static and a rotating part, maintains electrical contact between the rotating array and the static part of the transducer. The original images are transferred to a workstation for reconstruction of the datasets and semi-automated analysis of the LV endocardial contours . This allows rapid calculation of LV volumes, ejection fraction and wall motion analysis. Such a special dedicated system offers advantages for follow-up studies, stress echocardiography and during interventional procedures (e.g. resynchronisation therapy). Initial experience indicates that this near real-time approach is an alternative to real-time volumetric systems for global and regional wall motion analysis of the LV. The ideal way of three-dimensional echocardiography is on-line acquisition of a three-dimensional dataset of the heart without the need for ECG and respiratory gating avoiding spatial motion artefacts. The first real-time 3D system has been developed by Von Ramm et al. at Duke University and most experience is with this system (Volumetric Medical Imaging). This system makes use of a sparse matrix phased array transducer of 512 elements to scan a 60° × 60° pyramidal tissue volume using parallel processing technology which permits the reception of 16 lines for each transmitted signal (16:1) at a rate of 17 volumes/sec with a depth of 16 cm. Image display for analysis consists of 2 independent B-modes or 3 C-mode scans (these are cross-sections parallel to the transducer face which are displayed simultaneously in selected orientations. LV volumes are calculated with dedicated analytic software from either a series of parallel C-scans (short-axis views) or a series of rotated apical long-axis views. More recently, Philips Medical Systems has introduced its live 3D system using a matrix phased-array transducer with 3000 transmit-receive elements. In this transducer, multiple recordings are automatically performed to cover the full left ventricle. This is especially useful in dilated ventricles because of the limited sector angle. The multi-directional beam steering capability enables visualization of two views of the heart simultaneously. Experience is still limited, however, promising results have been reported. Movie 2 [see additional file 2] shows a parasternal long-axis view obtained with the new Philips matrix transducer. Table 1 and Table 2 provide an overview of studies comparing left ventricular volumes and function by reconstruction and real-time three-dimensional echocardiography, respectively, in comparison with magnetic resonance imaging [12–19]. For the various 3D acquisition methods that have been used, a good correlation can be observed. However, most three-dimensional echocardiography studies tend to underestimate ESV and EDV. It should also be noted that large differences in study design were present, including number of patients, LV volumes, image quality and analysis methods. In recent studies, new semi-automated endocardial border detection algorithms replace common methods to measure LV volume, as Simpson's rule and algorithms based on manual border tracing. Three-dimensional echocardiography is a non-invasive technique which can be performed in many clinical scenarios. It is thus ideal for daily performance and for serial follow-up examinations of left ventricular volume and function. Regardless of the many improved techniques in three-dimensional echocardiography, time consumption has been the major limitation hampering its routine employment for daily diagnostic echocardiography and for volume and function assessment. Faster data acquisition by reducing the number of cross-sections for reconstruction of the cavity, using a high-speed rotation transducer or a volumetric real-time three-dimensional echocardiographic transducer is being investigated. Data processing and three-dimensional image reconstruction has been accelerated and on-line processing and reconstruction is under investigation. Manual endocardial tracing needed for volume measurement is both laborious and prone for subjective errors. Development of various automatic border detection algorithms along with the improvement of ultrasound spatial resolution and advances in other novel modalities such as harmonic, power-mode Doppler tissue imaging and development of stable intravenous ultrasound contrast agents that enhance the delineation of endocardium, should be able to avoid the need of manual border tracing and provide automatic, even on-line, volume measurement.